Have you ever met someone who doesn’t like cream puffs? Me neither. With that light and airy shell, the smooth and creamy vanilla filling, and the pretty sprinkling of powdered sugar, this simple French pastry is one of the best. treats. ever. Feeling ambitious last weekend, I decided to try and make my own version of cream puffs. Admittedly, I was a bit nervous as I had never made my own pastry dough before, but after doing lots of research on the classic recipe, I found one with which I was particularly pleased. Now what surprised me the most about the process of making these cream puffs is how incredible EASY it is… really! 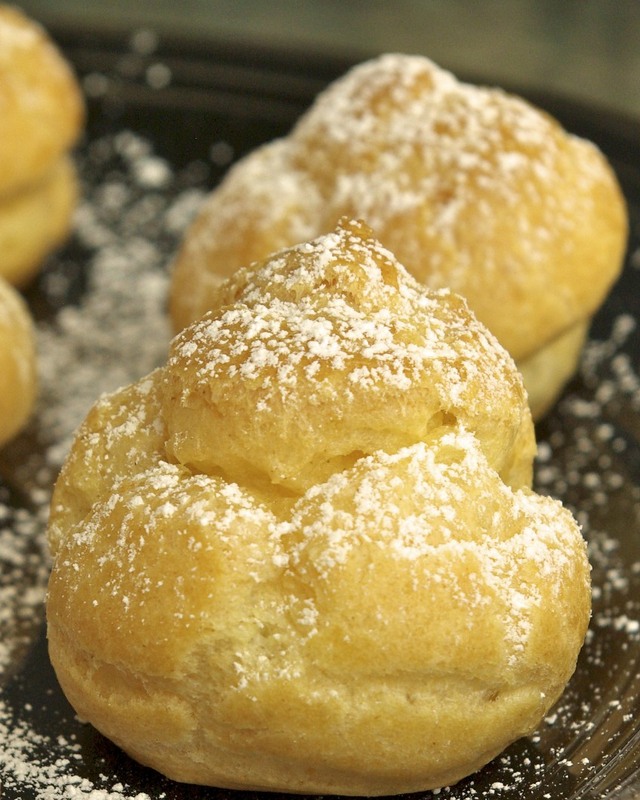 Follow the recipe step by step and in no time you will have bakery quality cream puffs at home. Enjoy! When you pull your puffs out of the oven, use a toothpick to poke a hole in the side of the puff. This is VERY important, as it allows any excess steam to escape, and prevents the inside from getting soggy. I pipe my puffs onto a baking sheet with a large Wilton 2M piping tip. If you don’t have a tip, you can simply transfer the filling to a freezer bag and snip off a small corner, easy! Similarly, I pipe my creamy filling into the puffs with a small piping tip, but you can also cut the puffs in half, and simply fill with a spoon. 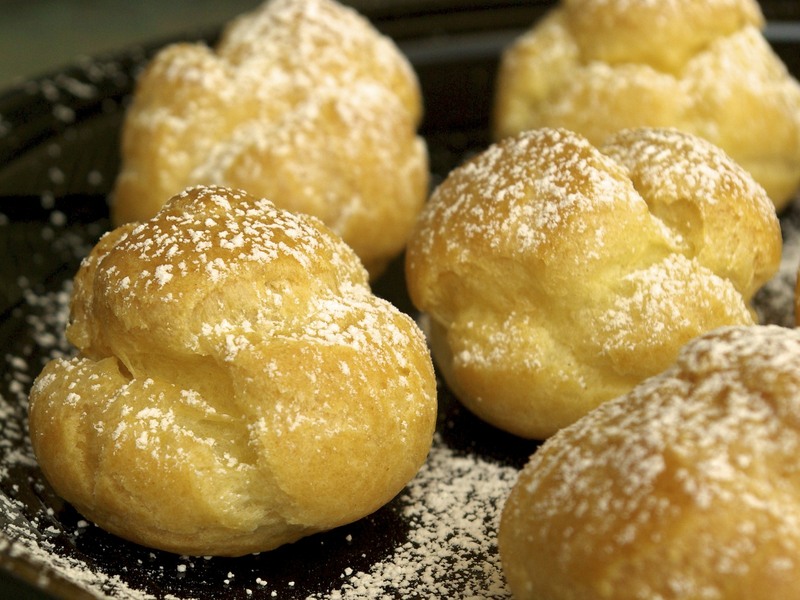 You can make these puffs extra indulgent by dipping the tops in a delicious ganache. Mix together vanilla pudding mix, cream and milk. Cover and refrigerate to set. In a large pot, bring water and butter to a rolling boil. Stir in vanilla, flour, and salt until the mixture forms a ball. Remove from heat. Using a wooden spoon, beat in the eggs one at a time, mixing well after each. You want the dough to have a smooth, sticky, “elasticky” consistency. You may also transfer the dough to a stand mixer at this moment and beat in the eggs for about 2-3 minutes. Transfer pastry dough to a piping bag fitted with a large round tip (see notes above). Squeeze by tablespoonfuls onto a parchment lined baking sheet. Bake for 20 to 25 minutes in the preheated oven, or until golden brown. Centers should be dry. Using a toothpick, poke a small hole in the side of each puff to release all steam. Allow to cool fully. When the shells are cool, either split and fill them with the pudding mixture, or use a pastry bag to pipe the pudding into the shells. Now you just need to make your own creme patissier. Vanilla pudding mix indeed! These are used to make the traditional French wedding cake pièce monté". I remember when we went to pick ours up at the bakery, it was really windy and we were terrified it would topple over because it's hollow inside and the only thing holding it together is caramel. We should make creme patissier together and try it out. I keep promising Greg I'll try it when I'm gone so i can make him a millefeuille when I'm back. I know I know…one thing at a time 🙂 I didn't even know what to call the creme in order to begin searching for a recipe, but now I do! That will be next on my list. Ack! I have to forget I saw these tempting treats. puffs with come warm chocolate syrup are one of my favorite treats. Oh wow! That just means you get even more delicious cream filling in each puff 🙂 Mine were about the size of golf balls, how large were yours? I hope you enjoyed them! Yum, Robin! What a tasty breakfast 🙂 I hope you enjoy! I made these last night for our 3rd wedding anniversary, and they were phenomenal!!! We had to give the rest to my in-laws because we were going to make ourselves sick eating them. But they were SOOO good! That's wonderful, I'm so glad that you enjoyed them 🙂 Happy Anniversary, too!